Sequel to tough and gritty time travel thriller Blood of Heroes. A team of time travelers goes back to the Battle of Marathon in ancient Greece to foil a plot by alien masquerading as gods and by evildoers from the future. Jason Thanou is a time traveler with a past--and a burning mission. When the gods of ancient Greece proved to be not only monstrously real, but totally alien--and poised to dominate humanity forever--Jason took care of the situation, at least in Minoan Crete. Now he's got what looks like a normal assignment: to lead a time traveling expedition of scholars to the battle of Marathon and record for the benefit of future historians the magnificent stand of Greece's hoplite warriors against Persian invaders. But the Olympians are not done with their attempt to dominate humanity. Now the god Pan is afoot in Greece-a creature who may have the power to turn ancient Athens away from her budding democracy and toward a corrupt future on an Earth dominated by twisted humans and evil alien forces. But not if Jason can discover Pan's secret, thwart a conspiracy that stretches for millennia--and save the birthplace of democracy from the corruption of the gods. Steve Whitecompleted a tour of duty in Vietnamas a naval officer. With David Weber, he has collaborated on Insurrection, Crusade, In Death Ground, and the New York Times best seller The Shiva Option. 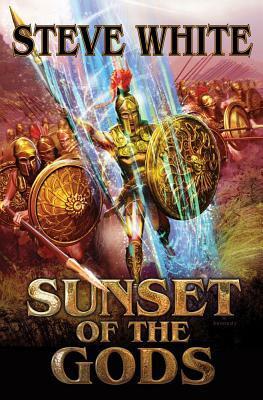 His most recent books for Baen were its sequel, Extremis, with Charles E. Gannon the epic fantasy, fiction novel Eagle Against the Stars and the science fiction time travel series that includes Blood of the Heroes, Sunset of the Gods, and Pirates of the Timestream.